This is our longest Westmorland Way holiday covering the 95 miles in 9 days. The first day is the longest day covering 12 miles and there is a mountainous section between Patterdale and Grasmere, but it is perfectly achievable by all fit walkers. 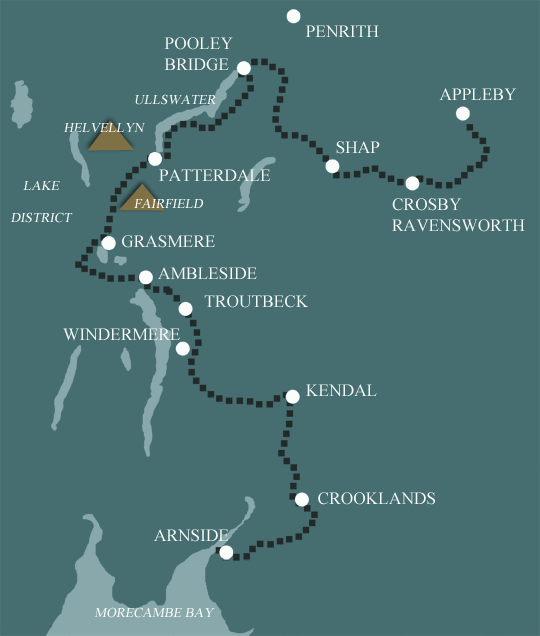 We have split the walk between Kendal and Arnside, where the Lancaster Canal joins us with its interesting towpaths and countryside views. The first day starts under the Pennines and ends on the fringe of Lakeland. Starting along the River Eden, the route leads through fields and quiet lanes linking Great Ormside and Great Asby, two lovely Eden Valley villages in between, the charms of Rutter Force are enjoyed. Carrying on over higher ground you will walk to Crosby Ravensworth, a secluded town. Shap is then reached by way of a stone circle and some typical limestone scenery. Although this is a fairly strenuous first day, the following days are considerably gentler. On leaving Shap you will walk past Keld Chapel and Shap Abbey before arriving at the river Lowther. Later, a climb up to the lovely village of Askham will provide you with some wonderful views. The route then drops down to a Norman church at Barton where you will meet the River Eamont. Follow the river to Pooley Bridge which is located at the end of Ullswater, England’s second largest lake. From Pooley Bridge the walk climbs gently on to the slopes of Barton Fell, where easy routes lead past an impressive stone circle before commencing a classic descent towards Howtown, with tremendous views down to the Lake. The route then takes in isolated and scattered communities of farmsteads and churches before heading to the lakeshore for a fine walk to Patterdale. 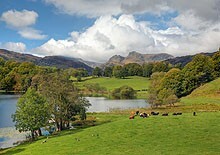 From Elterwater in the beautiful Langdale valley, you will follow the river Brathay into bustling Ambleside. The final stretch encounters Jenkin Crag, which provides glorious views across Windermere (England’s largest lake) to the Langdale Pikes, before dropping down to this evening’s accommodation in Troutbeck. Troutbeck is famous for its beautiful 17th Century farmhouses with mullioned windows and tall cylindrical chimneys, so characteristic of Westmorland. From Troutbeck, field paths are largely used to approach the attractive fell of School Knot, a major local landmark, before charming undulating paths lead you to Underbarrow, in the Lyth Valley. A final climb up to Scout Scar with a picturesque walk along the edge is followed by a gradual descent into the medieval market town of Kendal, for your overnight accommodation.